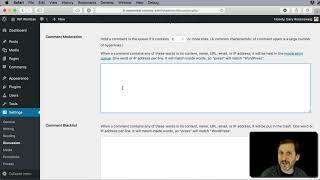 WP Tips and Hacks – Page 8 – Take control of your WordPress site with simple coding hacks and video tutorial tips. When you are creating a new site, you may want to have the site not appear at all to anyone. Well, anyone but you and others working on it. There are variety of plugins that will do this for you, but it is easy to do with a few lines of code in the functions.php file too. All modern browsers support some sort of private or incognito mode that opens a new browser window and show you pages as if you are a user who has never been to the site before. 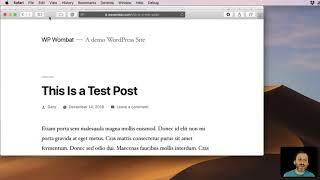 You can use this to test your WordPress sites and pages without needing to log out of your account to see a completely new-user view of the pages. Suppose you write about a topic in a three-part series. So you have three separate posts. When a reader comes to your site from a link to a specific post, you want to make it clear to them that this is one post in a series, and perhaps link to a list of all of the posts in that series. So when you try to login to your WordPress site, and you get the password wrong, you get a message that reads “ERROR: The password you entered for the username X is incorrect. Lost your password?” This can be bad because it gives up some information: that the user name is correct. Why give up that info to someone trying to break into your site? If you look at any big news source, they often have articles with multiple authors in the byline. You’d think this is something that WordPress would handle by now. But it still requires a plugin to do it. 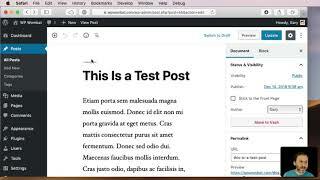 After you update to WordPress 5.0, you get the new Block (Gutenberg) Editor by default. But you can still add the Classic Editor as a free official plugin. Once you do that, you get the option to assign one as the default editor. 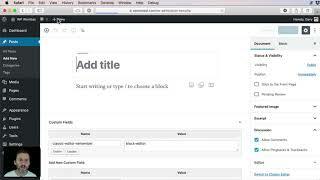 You can also allow individual writers to pick their default and easily switch between them while writing a post.